There are no shortage of churches who offer something which they hope will be relevant to the person reading their stated aims or values on a website. But rather than have us try to sell you some religious goods and services, let’s start with you, by asking you a question. What are you seeking or hoping for? Common responses are a church which has authentic community; a church with a youth group in order to keep my kids in the Christian faith; or a church with vibrant worship and inspiring sermons. Some I suspect, hope that the particular church will be able to offer world peace and are disappointed when it fails. When we dig further into the expectations which some may hold, we usually find responses like ‘I hope it will be a place where my needs will be met’, or ‘a place where God is really at work’. As important as these needs might be for you, there is still something deeper which I would like to mention. It is our deepest human need, which when it is focused on, brings order to our external world and to our relationships. It is very simple, and profoundly meaningful and yet, if we are honest, sometimes frustratingly difficult to live with. It is Jesus Christ. We would hope that you are seeking Christ above all things and would see the local church as a hospital for recovering sinners. One theologian described it as a field hospital on the battlefield of life. So returning to the original question about what you are seeking, Christianity is for those who have decided to explore and seek something beyond what they have. They have embarked on a path with the hope of finding ‘something’, ‘truth’ or God himself. This requires an attitude of openness. 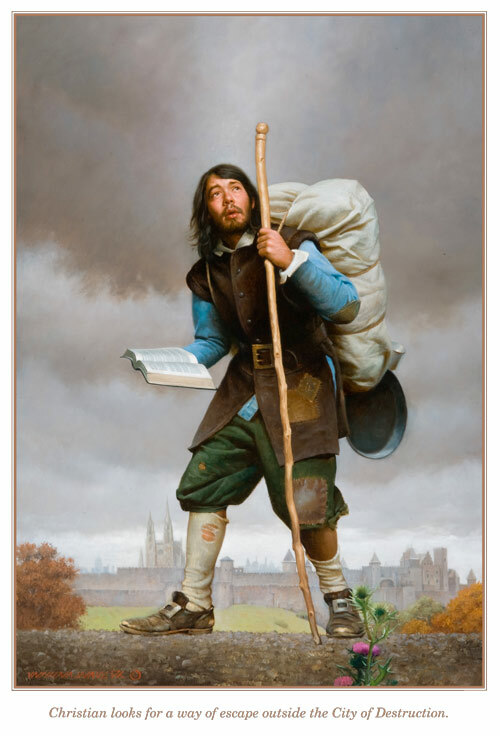 But what sets a person on the path to begin their pilgrimage will vary according to their background and experience. It may be due to their experience of love by a Christian who has cared for them and demonstrated the love of Christ. When they recognise this love, they might respond by beginning to seek and find the Person who is the source of this love which has transformed their friend and perhaps their own life. Others embark on a quest – to find religious truth, whether God is real or if Jesus is just a mysterious figure or an actual historical person. There are two images which capture this intention by someone who is committed to learning about and experiencing Jesus Christ in their lives. The first is of a mountain with a path leading to its summit. This is why the picture of Cradle Mountain in Tasmania has been used on this webpage. It is a metaphor frequently used to describe those seeking God and to see his face, that is, his intimacy. A closely related metaphor to the ascent of a mountain summit is that of pilgrimage, to undertake a journey with the intention of seeking God and journeying to a place or shrine where God might be encountered. This metaphor was also used by the English writer John Bunyan, in his well-known book about the Christian experience, ‘The Pilgrim’s Progress’. How then do we view the local church? It might be viewed like an inn that you turn into to find refuge, warmth and the host (Christ), welcoming you around his table of fellowship. The church is also a sign to the world, that Christ’s death which brought redemption and reconciliation with God, and his resurrection which brings life and transformation to the world, are relevant and real. This is good news and why we want to share it gently with others, first by living lives which are graceful and life-giving, and then by word and encouragement. Pilgrims travel best and are most likely to reach their destination if they travel together. This is why the church (which is often called in the New Testament, the body of Christ), is so important. We can’t undertake the journey alone. We need encouragement and frequently, advice and the wise counsel of those who are further along to guide us with a word that sustains us. The church is therefore, concerned about religious matters and their social implication, not a social or community club of like-minded individuals like a Rotary Club. We also need to note in the light of the quotation above, that the church’s role is not to cater for religious consumers who for various reasons, treat church attendance as a discretionary activity amongst their many other commitments. Our role at St Edward’s is a fairly simple one. It is to help you undertake your pilgrimage as a disciple of Christ, to help you live your faith out in your daily life and intelligently engage with others about why Christ makes a difference in your life, to your aspirations and for the world. We would hope that we can encourage you to develop holy habits and practices that help connect Sunday to Monday. Our children and friends, when they see our practice of our faith, will then be encouraged to adopt it as their own. Finally, if you join us, we would hope that you will use your God given gifts and abilities to help us to do the same and to nudge others to follow Jesus as his disciple. This image is one which is seen in the Bible where Moses ascends Mt Sinai to see God and receive the Law (Exodus 24:18; and then again to have the covenant renewed (Exodus 33:12 – 34:9). Elijah journeyed from the far north of Israel down to Mt Sinai/Horeb seeking God’s affirmation in the form of earthquake, fire and thunder after he had defeated the prophets of Baal (19:1-18). These signs were denied, but the LORD spoke to him, in a gentle whisper. There is the well-known story of Jesus on the Mount of Transfiguration who ascended and was transformed before his three closest disciples showing his glory (Matt 17:1-13; Mk 9:2-13; Lk 9:28-36). A gifted writer of Hebrew songs (the Psalmist), uses this image to encourage the Israelites as they undertake their annual pilgrimage to Jerusalem (Psalms 15:l; 24:3; 99:9; Isaiah 2:3; Micah 4:2.). The metaphor appears also in the book of Hebrews 12:18-29; to contrast the old covenant instituted under Moses which is now redundant, with the new Zion, Jerusalem; a sign of the new covenant.